With the Night Brightness slider you can set the Brightness during the night. 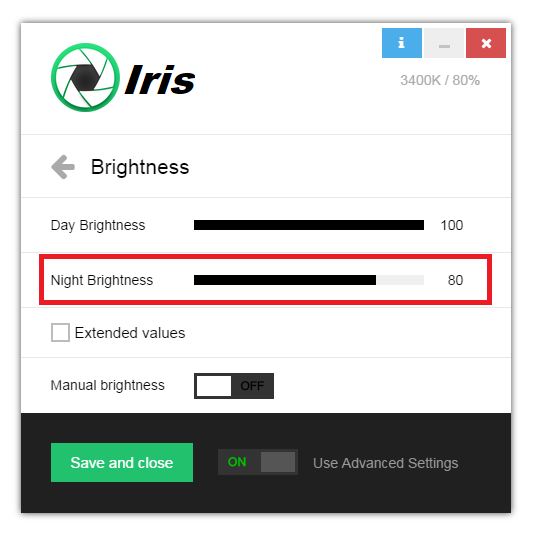 Iris detects if it’s day or night based on the clock and location. If you don’t see change when you move this slider make sure that it’s night. The values are based on % which is the standard measure for Brightness. The lower the value the darker the screen, the higher the value the brighter the screen. The effect will only be visible if it’s night. Aside from this, to move the slider you need to click on the black area and drag left or right with the left mouse button. I’ve got a Question: When i set the Brightness to manual – i am not able to get a setting lower than 50%. Is there a way to make the screen even less bright? The mean thing is the screen would show me what it would look like at first – but as soon as i let the handle go it’ll pop right back to 50 and stay there. Can you make sure you are not settings the Night Brightness while it’s a day and vice verca? Can you try to click this and reset your settings? If that doesn’t help, can you try doing it manually as shown in this short video?